Join us for Educational Eco tours or Happy Hour Sunset Sail offered daily. Lunch or dinner sails available on private charters. We carry up to 30 passengers. Sail Maine for a real adventure. See Rockport and Camden’s stunning coastline and islands from the deck of the Classic Schooner Heron. Built in Maine by the owners and captains Nigel and Bonnie, the Heron is a truly unique experience. Many guests say that it is like sailing with a friend. 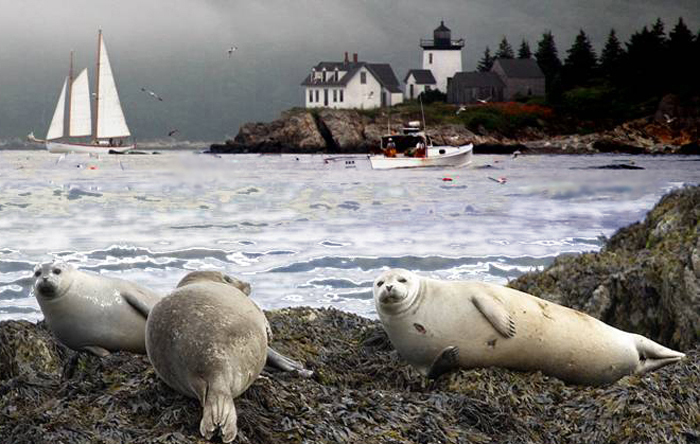 Rated one of the best things to do on the coast of Maine. Educational Eco Tours $50/person, kids $28. Happy Hour Sunset Sail $55/person. $50/person (child 12 & under $28) minimum age 2 years. Welcome to the historic town of Rockport Maine. Take a morning or afternoon sail aboard the Heron and enjoy an educational narrative Eco tour with environmental educator and Captain Bonnie Schmidt. With 25 years of experience sailing the Penobscot bay, Bonnie will guide you as we sail the Bay…. Learn about the history of the once busy industrial town. Rockport was won in a card game in Boston by Robert Thorndike in 1769 and separated from Camden after a dispute over replacing the collapsed Goose River bridge. Kilns in Rockport were processing lime rock for over 200 years and it’s great schooners lined the waterfront loaded cargoes of “hot lime” down the coast for use in construction. Ice was cut on Lily Pond and loaded on board schooners for export to distant ports all over the world. Rockport’s most famous schooner the Fredrick Billings towered more than three stories tall from the keel to the deck . Weighing over 2600 tons this 4 masted schooner was built out in the open at the head of Rockport Harbor in less than a year! We will also explore the history of magical Indian Island lighthouse as we sail by and learn what lead to Rockport’s decline and therefore the private sale Indian Island light in 1934. Learn About Maine’s Lobstering industry and why Penobscot Bay is the best in the state. We’ll tell you about the life cycle of your favorite crustacean. With a prevailing afternoon southerly breeze Heron will take the Penobscot Bay in her stride and head towards Robinson’s Rock, home of the famous Andre the seal. With favorable wind and tide we can sail close to the ledges and often see dozens and sometimes hundreds of seals asking on the ledges. 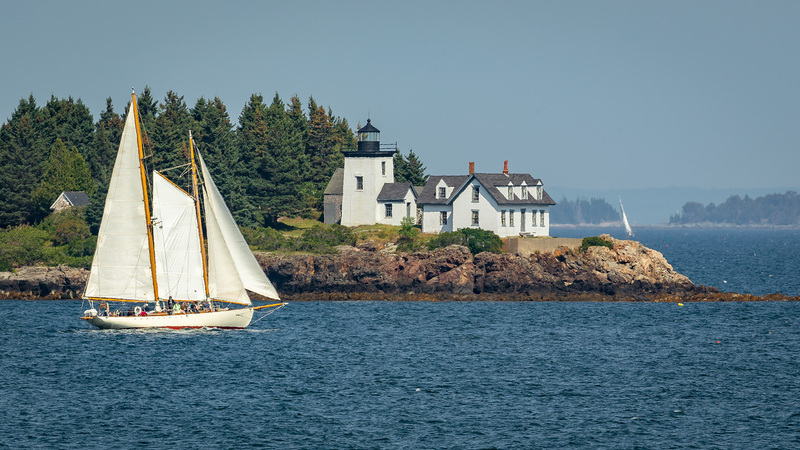 Spend an afternoon aboard this legendary classic on the magnificent Penobscot Bay. Beer, wine and soda available for purchase on board. Eco sails daily mid-June through early October. Check out this video of the eco sail. 1 complimentary rum punch with chips and salsa. Craft brewed beer, local wine and soda available for sale on board. This is a truly unique sailing experience. A perfect opportunity to sail the Penobscot Bay and see the setting sun behind Beech Hill. Check our calendar for music nights. Sunset sails daily mid-June through September. We suggest that people wear the proper clothing for the sail. It is always cooler on the water. As the saying goes, there’s no such thing as bad weather, only bad clothing choices! 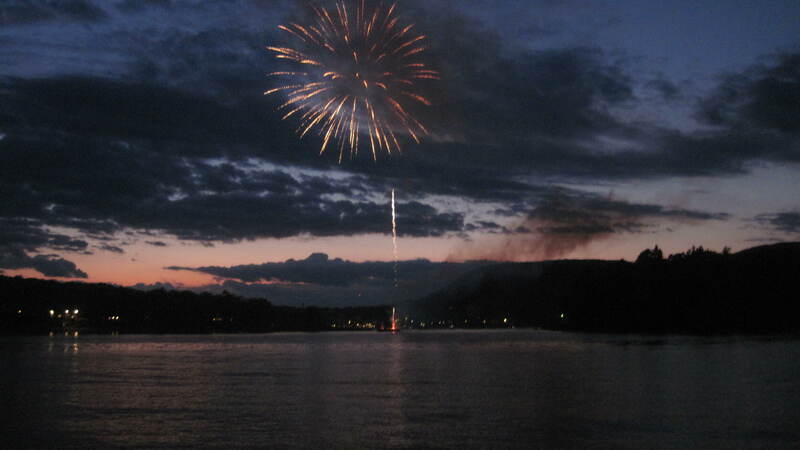 Check out our Maine Special Events too. New this year: PHOTO CRUISE with Michael Leonard.